One week after the election, I asked my neighbor to go for a walk. We circled the neighborhood, somewhat dazed, talking about how surprised we were by the outcome and how we felt that many of the laws and issues that were so important to us and that we took for granted were all of a sudden at risk of being weakened or repealed altogether. We were angry at the situation, to say the least, and I in particular was angry at my own complacency over the last 16 years. My contribution to civic engagement during the Bush and Obama years was a few donations here and there and a subscription to The Atlantic. I think I felt especially dazed because we had been shielded from the fury of the people attending rallies to support Donald Trump throughout the Rust Belt and the south. You see, we live in the bubbliest of so-called bubbles, Berkeley, California, and it’s easy to forget that many people do not agree with the goals of liberal activism that Berkeley has been famous for since the 1960s. We had also been shielding ourselves; living in Berkeley made us forget that that those goals and ideals need to be addressed and bolstered constantly. I read newspapers and voted, sure, and dutifully listened to the late-night hosts skewering the latest obstructions Congress had cooked up, but somehow I managed not to learn about the incredible and devastating losses of Democratic seats in state legislatures, the effects of gerrymandering and voter suppression on the electorate, and the importance of laws and rights that were being weakened. Later that day we sent out a call to action to all of the local women that we knew, and two weeks after that we all met in someone’s living room. That first meeting consisted of thirty women, sharing feelings, thoughts, and ideas. The second meeting, two weeks later, had nearly fifty women. We decided to list the political and social topics about which we felt most strongly – from there split into four subgroups covering the environment, women’s rights, civil rights, and elections. We have had many meetings since then, both as a large group, and as subgroups. We have a calendar and a website and a standing date to visit our senators and our congresswoman. We have a name, based originally on the WE party (a play on the Tea Party); we have become WEactivate. And WE are not the only ones. Every single person in our group is also affiliated with another small group. Call them salons, parlor groups, community organizations, whatever you like, they are everywhere, and they are growing. Some people are also affiliated with OFA, Indivisible, Sister District, MoveOn, and others. Together, this network of groups is creating a movement: a new dedication to progressive civic activism. And WE’re activating all over the country. Chances are someone has started a group in your area. If not, or if it’s hard to align with another group, start your own. 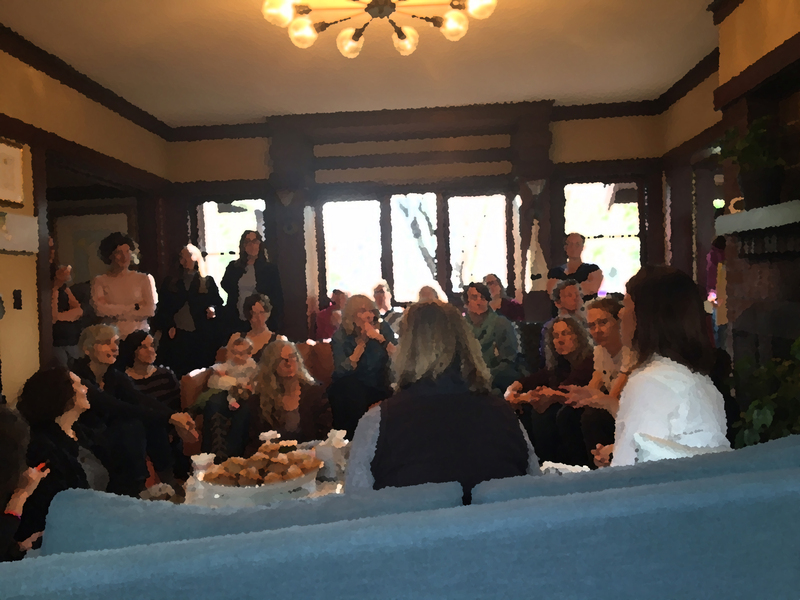 All you need is a living room, some people who have been awoken to civic engagement, and a list of causes you are passionate about fighting for. Pastries help too. HAPPY MONDAY! HERE ARE SOME VIDEOS AND LINKS I LOVED THIS MONTH! Stay in touch and receive monthly newsletters with the posts you missed. K BEAUTY FOR THE HAIR :: UMMA'S GOOD HAIR DAY OF SEOUL - AVAILABLE AT COSTCO! Little. Yellow. Different. Raised Catholic. Culturally Jewish. A participant in positive culture change. Semi-holistic mommy to two. Wife to one. Attorney. Black belt. Career-mom and LA Lifestyle Blogger. These are my musings on mama stuff, health+wellness+beauty and all things cultural for the Gen-X crowd. get inspiration from SHE SAID delivered right to your inbox every month.